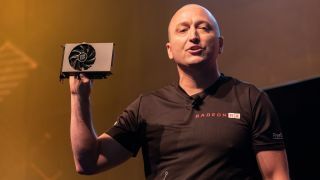 We’ve known that AMD had a nano version of its Radeon RX Vega graphics cards since those cards were initially announced, but only now, at Computex 2018, has the company finally made it official. AMD revealed a micro-sized version of the AMD Radeon RX Vega 56 at its press conference. The card pictured above comes from PowerColor, and it’s only a small step behind the full-sized version of the GPU. We’re still confirming the final specs with AMD and PowerColor, so stay tuned for updates to this article. Interestingly, the Radeon RX Vega 56 announcement comes shortly after the introduction of a beefed-up Nvidia GTX 1050 with 3GB of VRAM. We’ve been starving for new graphics cards in the computing world, and while it’s not exactly all new it looks to be an exciting new card for small form-factor builds. AMD also announced a new partnership bringing FreeSync technology to Samsung’s QLED 4K TVs for gamers. This will work as it does on PC monitors, synchronizing the refresh rate of a display to the frame rate of compatible Radeon graphics cards to eliminate visual artifacts such as screen tearing, input lag and stuttering. The FreeSync technology is compatible with Samsung latest 2018 QLED TV range, which includes the QLED 55-82-inch models and the NU8000 / NU8500 55-82-inch Series. The update will soon be delivered to users as an automatic Gamer Mode firmware update.